We identify three AFC South players who could lose dynasty value after the NFL Draft. Check out part one of the series highlighting the AFC North. 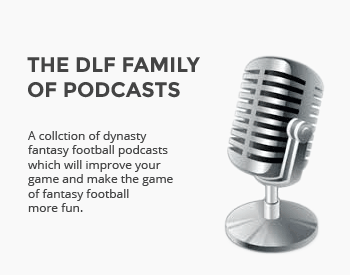 Here is the second part of an eight-part series highlighting three dynasty players in each division on the value hot seat leading up to the NFL Draft, complete with actionable pre-NFL Draft dynasty advice (note: for purposes of this article series, assume a 12-team super-flex, full PPR scoring format). Two seasons ago the Indianapolis Colts drafted South Florida standout Marlon Mack in the fourth round of the 2017 NFL Draft. After a lackadaisical rookie year, the Colts showed confidence in the veteran Mack as a sophomore. Despite battling soft tissue injuries throughout the year, the former Bull secured 212 touches for over 1,000 totals yards, good for 14.3 points per game and an RB19 finish. Mack held off Jordan Wilkins for the early down role and, despite Nyheim Hines taking much of the receiving work, 17.7 touches per game proved the Colts have faith in Mack as a three-down threat. After surviving a free agency period where the team has not added any appreciable ball-carriers, the NFL Draft remains a major hurdle for Mack’s value. Current ADP data places him at RB19, right behind Derrick Henry and ahead of the near-consensus top rookie running back in Josh Jacobs. Dynasty owners have been optimistically cautious in buying Mack all off-season and will feel a lot better about it if the Colts fail to make a day two or earlier investment at the position in the upcoming draft. Chill’s Take? The upside of an above-average talent in the Colts offense and factoring in the touches he saw in 2018 makes Marlon Mack a worthy risk at 1.06 or lower. He compares favorably with any running back in the 2019 class and already has a top-five landing spot on lockdown. What a whirlwind the last two seasons have been for Nick Foles. After being named Super Bowl 52 MVP, Foles saw another opportunity in 2018 following the delayed recovery of Carson Wentz’s ACL injury and the back injury that shut him down after Week Fourteen. Foles led the Eagles to three straight wins to earn a wild-card birth and a dramatic opening round win in Chicago over the Bears. Foles opted for free agency after declining his option with Philadelphia and signed a four-year, $88-million-dollar deal with the Jaguars with $50 million in guarantees. This contract locked Foles in as an asset in super-flex leagues, so we thought, but the draft brings the possibility of a successor being added in Jacksonville and presents one last hurdle for dynasty owners. Even if the Jaguars draft a quarterback, the contract should secure Foles into at least one year with a starting job. After that, an open competition may be on the table and could shift the long-term outlook on Foles’ value at a heavily-demanded position. Chill’s Take? Foles is still a cautious buy in super-flex leagues with an ideal target range of 2.01 or later. His contract brings enough security of at least a year without a job disruption and given the current quarterback landscape, more than a year is worth paying that price. Will Fuller seems like a shocking name to make this list given how great his production has been when Deshaun Watson is throwing him the ball. He scores at a very healthy clip of 17.2 points per game in eleven career contests with Watson as the starter and has delivered a massive ceiling component to weekly lineups. After tearing his ACL in the Week Eight game against Miami, Fuller missed the remainder of the season, marking the second consecutive year of more than 40% of the Texans’ games without him. The injury-prone narrative continues to follow Fuller and has brought hesitation to dynasty owners despite his ridiculous production. Clocking in at WR38 in the latest ADP and the emergence of Keke Coutee (WR46 in ADP) as another big playmaker in the offense, Houston has been linked to both a tight end and wide receiver in the upcoming draft. With the former first-round pick out of Notre Dame battling injury concerns and a low volume-based production, another bite into the market share pie could continue to depress his value. Chill’s Take? Buy Fuller for any second-round pick in leagues with more than ten starters and sell for a first-round pick or in leagues with shallower starting lineups.